We want to let you know about an upcoming Zentangle Art Show in Connecticut in case you can attend. Meredith Yuhas, Ph.D, one of our Certified Zentangle Teachers, teaches at University of Saint Joseph in West Hartford, Connecticut. 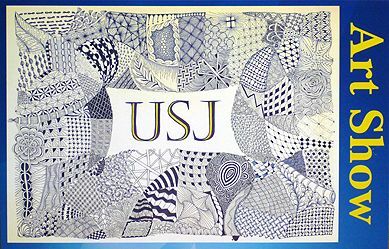 She has organized a Zentangle Art Show for Saturday, April 20, 2013 from 2-5 pm at USJ in the Bruyette Athenaeum, Reception Room. and details on event and submitting art. If you're in the area, stop by for a visit. We'd love to meet you! Our three 2013 CZT training seminars . . .
. . . are now full, but we are still accepting names for wait lists. If you would like to get on a wait list or if you any questions about seminar, please contact Martha Huggins at martha@zentangle.com. To begin learning more about our CZT certification program, you can start here. Last year we introduced our Zendala Set, a tin case of a mix of prestrung and blank circular tiles. "I am having a BLAST!!!!!!! I am also, according to my therapist, calmer and more focused than he has ever seen me. "Quietly exhilarated" is the way I describe it. "LOVE the Zendalas (I'm kind of a mandala freak); any chance you'll start selling refill packs to fit into the wowsome little storage tin? Unstrung option?" We're happy to say that they are now available on our store. Our original Zendala Tile set with case is $24.95. Our new Set of 21 Blank Zendala Tiles is $17.00. "I am [a] self taught artist. Last October I had a stroke and my world before then was erased. My sister introduced me to Zentangle. You have shown what strokes with a pencil and pen can do to take me to another fabulous world. This has nursed me back into art health and has lessened the stress of this major medical catastrophe I am experiencing. Thank you for enjoying and sharing this Zentangle adventure with us and with each other.